Composed by Claude Debussy (1862-1918). 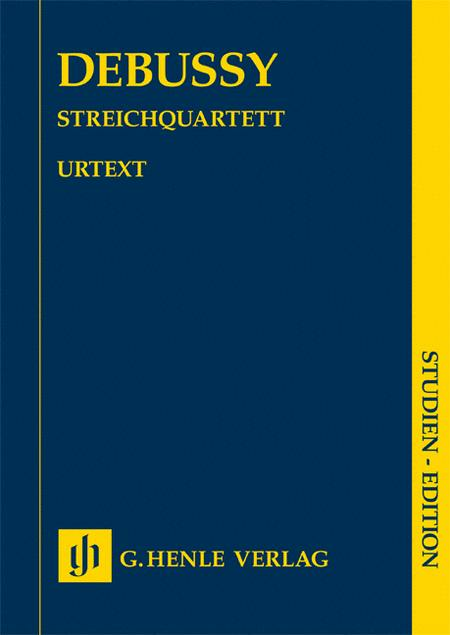 Edited by Ulrich Kramer. Sheet music. Henle Study Scores. Classical. Study score (paperbound). 68 pages. G. Henle #HN9999. Published by G. Henle (HL.51489999). Debussy's new string quartet received a very cool reception at its première in Paris in December 1893, performed by the famous Quatuor Ysaÿe. The critics were upset by its unusual harmonies and orchestral sounds, and the musicians who were later presented with it considered it “unplayable.” Nevertheless the work was able to establish itself in the years that followed and today belongs to the core chamber music repertoire. 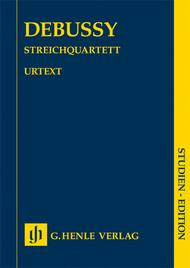 The work was published in 1894 as “1er Quatuor”; showing that the composer was at least toying with the idea of writing another such work at this time – yet he never did fulfil this promise.